So while I myself can’t even come close to answering that question – hopefully this poem will suffice for now. It’s the highest compliment, the deepest calling. And then the paper trail begins, blazing a path through a dense bureaucratic network of uploaded dreams and poorly stated ambitions. believing it will one day lead to a full fire of intention. yet no idea how to use them in a sentence. Let alone in life. Yes, we open borders, but more importantly, minds and hearts. Winning them, earning them, with the skills of our training and the purity of our efforts. This is something those who are new to the family realize, and eventually, eventually, 9-12 months eventually…. You will go forth from this time, and this place, toting all that you can carry of your past life and loved ones. Never, will you feel more alive – it will surprise you. volunteer, meets villager or teacher, meets student. It’s all right there. It’s tucked into the humble corners of each day. Two years- will fly by. Watch carefully or you might miss it. you will leave those same coveted, carefully packed objects turned artifacts in the fault lines of all your cultural earthquakes. You are returned volunteers, never former, and you try to trace the patterns of home and you stumble, and get dizzy, and people from the place you once knew ask …. How was Malawi? Ecuador? Mauritania? Poland? How was Nicaragua? Mali? Panama? Vanuatu? Romania? How was Tanzania? It’s been 50 years of imagination and inspiration. but we are a part of so much more. and find peace at our core. It’s hard to believe I’ve been living this new Post-Peace Corps Life for nearly two months. Ukraine feels like a dream I had — a full life lived with my eyes closed before I woke up in the morning. I expected returning to feel stranger and more bizarre –but the only thing bizarre about it is that it doesn’t actually seem all that bizarre. For a few days it was strange to hear people speaking English everywhere. I kept turning my head and thinking “Hmm…they’re speaking English!” before I remembered that almost everyone around me was speaking English. I’m still surprised when I make eye contact with someone on the street and they smile…and I’d completely forgotten how overwhelmingly friendly Americans are nearly all of the time. Shopkeepers, bus drivers, strangers — they’re so friendly for no reason. I find myself taken aback, suspicious of their big smiles and eagerness. Shopping is still a rather intense experience — you can buy anything at a supermarket in America. And of course I knew that and knew to expect that it would be overwhelming. But knowing that something is going to be overwhelming doesn’t make it any less overwhelming. That said, it’s been surprisingly simple to return to life in the States. I still can’t really think about Ukraine without getting choked up and this isn’t the post where I reflect about what it all meant to me. I’m still processing those thoughts and the entire experience. However, I’ve moved to DC and I’m in the process of getting the details of life all figured out. I just wrote a check for a deposit and October’s rent and will move into my new place on Sunday. I’ll be renting a room in a two-bedroom apartment in a really cute neighborhood. My new roommate seems very friendly and fun and she has a dog and a cat, which I’m excited about. I’m less excited about job-hunting, which I’ve been working on diligently since I arrived in DC two and a half weeks ago. It’s stressful and I’m beyond nervous about how I’ll make ends meet if I don’t find a job very very soon. But I’m doing my best to be optimistic and to work as hard as I can to find a job that will allow me to make ends meet while also enjoying myself. I believe that it’s absolutely possible and know that it’s only a matter of time. So here’s to hoping that a little bit of luck will go a long way! The last three years of my life have been filled with acronyms. When I first arrived in Ukraine as a PCV (Peace Corps Volunteer), I attended PST (Pre-Service Training) where I was taught by an LCF (Language and Cultural Facilitator) and a TCF (Technical and Cross-Cultural Facilitator), then when I arrived at my site I regularly completed things like the VRF (Volunteer Reporting Form), attended events like PSTU (Pre-Service Training University), organized projects like Camp KLLAS (Kids, Leadership, Lifestyles and Sports) and SEED (Seminars in English and Educational Development) and was supervised by the CD (Country Director) and DPT (Director of Programming and Training). Then as my two-plus years here came to an end, I completed my DOS (Description of Service) in order to COS (Close of Service). And now I am an RPCV (Returned Peace Corps Volunteer). For so long these acronyms have shaped every bit of my life — my work, my free-time, my friends, my responsibilities, and ultimately, my sense of self as a PCV. Being an RPCV is still very new and I have yet to work out what it really means as I think about who I am and how I see myself. Leaving my site last Sunday was one of the hardest things I’ve ever done and someday when I have a little more time and can put my thoughts into words, I’ll write more about it. But for now, all I can really say is that being an RPCV is a new and different way of seeing myself. I’m traveling through eastern Europe with my friend Betsy for the next two weeks and I’ll be back in the States by August 16th for a friend’s wedding. After that, I’ll visit my parents and extended family for a few weeks, and then I’ll move to D.C.
I’m in Krakow right now, which is beautiful and interesting and both very different and very similar to Ukraine. I miss Ukraine in a way I can’t even describe. And I’m not sure what I’m doing next…but I suppose I’ll figure it out sooner or later. Time for the next adventure — an acronym of my own- PPCL (Post-Peace Corps Life). Sidenote: One week and one day until I leave site and less than two weeks until I leave the country. I could die happy right now. Or at the very least, leave Ukraine feeling full of satisfaction — with the knowledge that I did a few things right. Last week I attended Camp IKnow, an environmental-themed camp organized by the PC Ukraine Environmental Working Group, for the third and final time in my service. I brought two of my most motivated first-year students and another girl from another school in Chortkiv. The girls had an absolute blast and were wonderful to have there all week long. I’d been looking forward to bringing them to this camp all year and knew that they’d take a lot away from the experience. 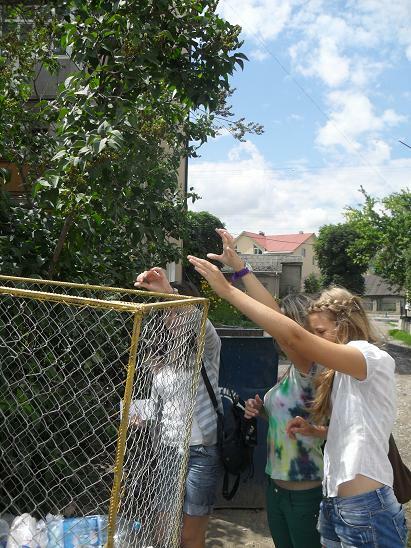 During the week the kids learn all about environmental problems in the world and in Ukraine and they also take project design and management classes to learn how to develop and complete projects. During the course of the week they actually create a project together as a large group and go through all the steps of project design and management, eventually completing their project in the host community. This year the kids created a combination clean-up and educational campaign project, and they created posters to hang up at the local lake they wanted to clean up. Then on the last day of the camp, they cleaned up the beach, staked their posters in the ground, and then went into the center of the village to educate the local people about what they’d learned during the week. It’s so exhilarating to watch the kids do projects like this — and if watching kids go out to speak to strangers with so much passion and enthusiasm doesn’t fill your heart up with optimism then I don’t know what will. We’ve only been home for three days, but my girls (Olya, Khrystyna, and Yarina) were already ready to get started and called me last night to find out when we could meet to begin our project. So we decided to meet today at noon to go out and do a community needs assessment. They were nervous about interviewing people in Chortkiv about environmental problems — it had been easier at the camp location, where they didn’t know anybody and didn’t feel as close to the situation. But we marched forth into the city and began our interviews. Within the first two interviews, the girls lucked into meeting a woman who works on environmental issues, specifically related to water. She gave the girls her card and told them to keep in touch with her because she was really supportive of what they want to do. That filled them with just the excitement they needed to continue interviewing strangers about environmental problems in Chortkiv. Once we finished our interviews, assessed the general situation of the city, and located as many recycling bins as we could, we headed back to my place to make an action plan. The girls had no trouble listing all the community needs and the goals of our potential projects and they definitely have no shortage of ideas for projects. They were shooting off the names of people they knew who might be able to help them, they were brainstorming possible projects, and making to-do lists for themselves with absolutely no pushing from me. I’m pretty sure my heart swelled to twice its normal size and almost exploded inside my chest. These girls are beyond ready to do something like this — they have all the motivation they need to get started, they have connections, and more than anything, they really have a great grasp on what exactly they need to do to complete a project — more than any other students I’ve ever brought to a camp, these girls get it. They understand that it might take a while, they understand how to make an action plan and a timeline. Usually it takes a few rounds of explaining for my students to understand that planning a project entails much more than just planning when you’ll do something. And so although it’s absolutely breaking my heart to leave here, I am leaving filled with so much hope for the future of this country, my students, and my site. Young people like Yarina, Olya, Khrystyna and all the amazing students I’ve taught over the course of the last two and a half years make me believe that things here will get better — that everything I’ve done here as a Peace Corps volunteer was not done in vain. Another thing I’ll miss — trains that take you anywhere and everywhere you want to go. If you don’t want to feel like an old sock when you wake up, the trick is 2-3 Benadryl, ear plugs, and an eye mask. There are a lot of things I’ll miss when I leave Ukraine and then there are the things I won’t miss one bit. Rain. Fall and spring in Ukraine (at least where I live) are outrageously rainy. I don’t think I’ve seen a full day of sunshine for over a month now. It’s rained at least a little bit (and often a lot) every day for at least a month, maybe even longer. It doesn’t even feel like summer right now it’s so rainy and chilly on most days. Lately it’s been really humid and sunny for part of the day, and then it rains like crazy later in the day. The humidity I’m used to – Kentucky is stupidly humid. But the rain is getting really old. I won’t miss this. The smell of the hog farm across the river from where I live – especially when it rains. I don’t think I really want to know why it smells so much worse when it rains, but the stink is repulsive and takes a lot away from the beautiful sight I see when I look out my window. Mud. Closely associated with the rain. See paragraph 1.Made much more annoying because of the fact that there are only occasionally sidewalks and most of the time I walk on dirt roads which just turn into giant mud pits when it rains for days. Not being able to buy what I want in the stores — either because they don’t carry those products or simply ran out. The only store in town that carried the Laughing Cow cheese I liked now appears to no longer stock the product. I’ve gotten used to this by now, but I’m looking forward to going to the grocery store and getting whatever I want. A shower with no shower curtain. I haven’t had a shower curtain for nearly three years and I’m really looking forward to having one again. I feel like that’s really going to enhance the quality of my showers in a way I’ve almost forgotten. My rickety bed. I’m really looking forward to sleeping through the night and not waking myself up because of the creaky noises the bed makes every time I roll over. Living with students. They’re fun and all and I love my students to pieces…but they’re also kids and they make as much noise as I’m sure I would have if I’d lived in a dorm when I was 15. But I’m not 15 anymore and staying up until 4:00 a.m. just isn’t as much fun as it used to be. Throwing away my toilet paper. That’s just gross. Sitting on steaming hot bus rides with all the windows closed because the older folks on the bus are afraid of the draft. Beating carpets clean. If I ever have carpets again you better believe I’m gonna buy a vacuum or strip the floors so I can just sweep them. The opinions expressed in this blog are mine personally and do not necessarily reflect the position of the U.S. Government or the Peace Corps.